Listen to my 30min. interview of November 2 with the Global Research News Hour in Canada dissecting the NAFTA 2.0 (USMCA) free trade of October and commenting on the upcoming November 6 midterm elections in the US. How it’s a softball deal, with few changes, and not even concluded yet, but touted by Trump as a major change to NAFTA 1.0 he promised to ‘tear up’. How the dairy provisions and intellectual property provisions are really about enabling US chemical companies to sell powdered milk into Canada. How the token changes in the USMCA dispute mechanism is about preventing governments suing US companies. How the steel and aluminum tariffs are not to be resolved until November. The agreement’s phony quotas on autos. Phony $16/hr. wage hikes in Mexico. 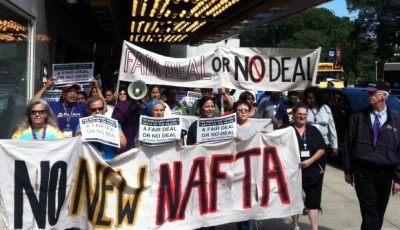 How the USMCA is designed to prevent Canada-Mexico negotiating trade deals with China. How China is the trade target, and an update on the status of US-China negotiations. The real issues in the US-China trade war. Plus my take on the polls about a ‘blue wave’ in coming US midterm elections and how, even if Democrats win, impeachment will not occur. My prediction of a ‘public consciousness bombshell’ coming out of the midterms regardless who wins. My critique of the Democratic Party and the failure of identity politics.